I have 'known' Chelsea for a number of years now online, having first encountered her on reddit when she was a brown belt living in Hong Kong. That led me to her awesome blog, when she was still posting as purplekettle. Most awesome of all is this post, entitled “Wow, you’re a lot shorter than I thought you were.” If you haven't read it before, go read it: I have read many, many BJJ blog posts over the last decade, and that remains right up there among my favourites. 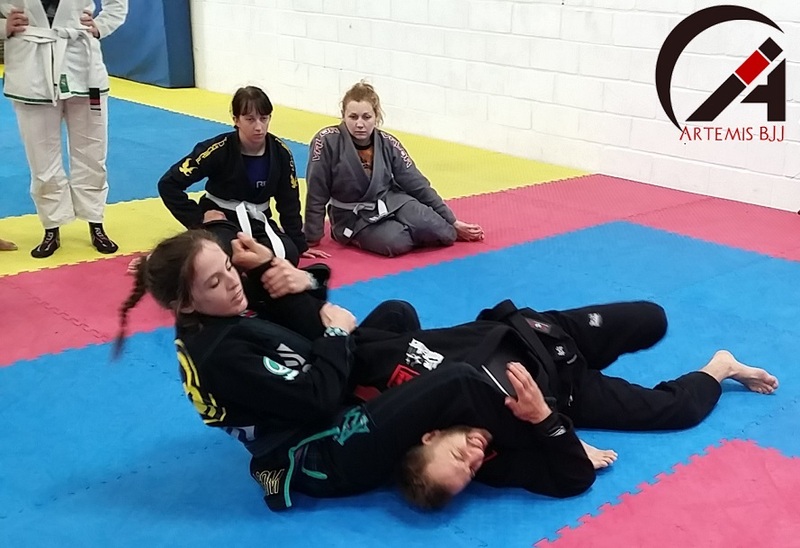 Since then, Chelsea has gone on to become a top competitor out of initially ATOS HQ, before moving to the affiliated Art of Jiu Jitsu Academy, run by ATOS stand-outs Rafa and Gui Mendes. She has won a world title at brown belt (after which Andre Galvao promoted her to black belt on the podium, along with his wife Angelica), the Dream submission only tournament and so far this year, medalled at the Worlds and Pan Ams. What I didn't realise was how good she is at teaching, perhaps helped by her considerable academic background (among her many skills she speaks fluent Chinese, for example!). Chelsea's teaching was well structured and focused, exactly what I want out of a seminar. She began with a number of drills related to passing the guard, the theme of the seminar. That progressed into some bullfighter passing drills. First, the one I'm used to, where you grab the bottom of the trousers, move round and drop the shoulder. Then we did the variation where you push the legs out of the way, establishing knee on belly. Chelsea and Tom (Barlow, of Polaris fame: it was very cool to have him there too) helped me out during drilling, noting that I should be pushing the shins so they 'spring' back, making it easier to then shove them out of the way. The central technique of the seminar, which began as a drill, was something I think I've seen Saulo do in the past on BJJ Library. Chelsea pointed out that in open guard, it seems people are overly keen to get stuck inside a guard, whereas they should be passing pre-entanglement. For this open guard pass, put one hand on their hip, the other on their knee. As you move around, bum in the air and legs wide, shove their knee down. Continue to pass around, then slide your grip so you can push their knee back. Follow it back with your body, moving into a leg drag position, driving off your toes as you descend. If you get greedy and try to go directly into side control, you may find they can get their legs in the way. Often, they will try to turn away into turtle, preventing the pass (especially in a competition where points are at stake). To stop that, drive into them as they turn, locking on a seat belt grip. Previously I have tended to gable grip my hands, but as Tom explained during drilling, grabbing the meat of your hand with your grip on top is stronger, bringing your elbows into your sides. Having secured your seatbelt, curl your leg in tight to their back, pulling them up onto your knee (effectively putting them in your lap). You can then roll back over your knee, bringing your other leg over the top, securing back control. I'm a big fan of that back take, though I've tended to do it from either technical mount or as a back re-take: getting some more tweaks was brilliant. It also made me think I should emphasise getting on your elbow next time I teach that move, as that really helps your balance. You may find that rather than turn away, they will try and turn towards you. If that happens, sprawl back with your seatbelt grip in place, backstopping their elbow so they can't continue the turn. Walk around on your toes behind them, then pop up so you're crouched by their back. Either put your foot on their thigh or step it through, then take the back from there. Marcelo Garcia shows something similar in his book, on p100. When you initially attempt the pass, your partner might swing their leg over and wrap your arm with it, moving into a lasso spider guard (I liked how Chelsea had everybody drill that spider guard recovery at this point, to make sure everyone knew it). To pass spider guard from there, reach through and grab their other trouser leg with your lassoed arm, being sure to grip below their knee. With your other hand, grasp their collar. Next is Chelsea's trademark control, driving her head right underneath their chin. Keep pushing with your head, something which they will definitely not enjoy, then walk back towards their legs. This is the same principle as with that pass from earlier, to make sure their legs are cleared out of the way. Which makes sense, as I can remember Chelsea's instructors, the Mendes brothers, highlighting the importance of walking back like that post-pass in a video a couple of years ago. 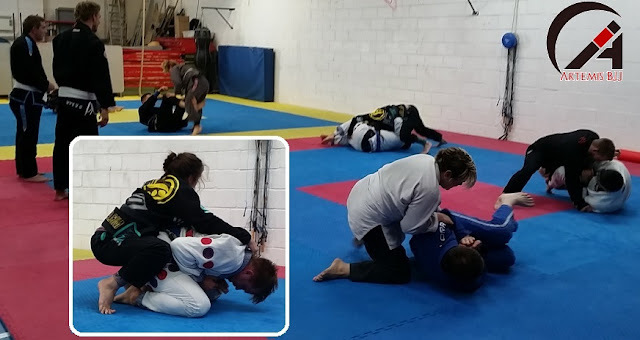 My drilling partner for this one, Nathan (the third black belt on the mats today), handily pointed out that I need to make sure I'm driving my shoulder into their leg to squish their knees towards the mat. I was being lax on that, which would make it easy for them to square back up and stop my pass. For a video of this pass, check out the interview Chelsea did on This Week In BJJ, here (she also shows the same pass from reverse de la Riva, as well as countering their invert). If they flare out their knee on the lasso so it is difficult to drive all the way to under their chin, Chelsea showed how you can instead drive your head into their chest, proceeding pretty much as before apart from that. Except that this time, you move into knee on belly rather than passing all the way to side control. 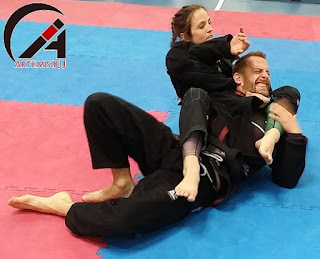 From knee on belly, if they push on your knee, you can reach through by the crook of their elbow, pull them up, then step around to drop into an armbar. Note that you need them to turn in towards you: this won't work if they are flat on their back, as you can't step over properly in that situation. After all that excellent technique, Chelsea then fit in thirty minutes of sparring, quick three minute rounds. I am pretty sure this marks the only time I've ever sparred three black belts in a row (and the only time I've seen more black belts on the mat was my visit to Fabio Santos' school). Sparring with Chelsea, Tom and Nathan, I was mainly trying to use the stiff arm from guard. When that didn't work, I tried my follow-up of going into koala guard, but messed up each time. I did vaguely attempt a roll under sweep with Chelsea, but she had already passed regardless. To finish, Chelsea did a question and answer session, a magnificent way of finishing a seminar. I asked about my main bugbear, back escapes. Chelsea recommended blocking their second hook coming in, then getting to the non-choking side and putting your back on the mat. She leapt right over when she did it, IIRC. Tom added in a nifty option when it came to turtle. If you can cross your ankles around their leg, then you've basically escaped turtle. However they move, you're either going to be able to spin free, invert, or recover your guard more conventionally. Therefore on top of turtle, be wary of them hooking your foot like that.